This is really a variation on Trump's Immigration dodge. Decapitation strikes just another dodge of the hard but far from impossible task of defeating ISIS. The targeting and killing of Sandhere and Nabil highlights the US government’s abandonment of counterinsurgency to fight the spread of jihadist movements throughout the Middle East, South Asia, and Africa. President Barack Obama ordered the withdrawal of US forces from Iraq at the end of 2011, and will reduce the number of US forces in Afghanistan to under 10,000 by the end of the year. US troops in Afghanistan are in train and assist as well as a counterterrorism posture, and are not dealing with the Taliban as an insurgent force. Instead of fighting the jihadist groups on the ground, the US has primarily relied on airstrikes, and in many cases, unmanned aerial vehicles that are more commonly called drones, to target senior and mid-level leaders of the jihadist groups. This tactic has been used against al Qaeda, the Taliban and allied groups in Pakistan since 2007, al Qaeda in the Arabian Peninsula in Yemen since 2009, and Somalia since 2006. While the airstrikes have killed some top leaders in the Islamic State, al Qaeda, the Taliban, and other organizations, they have not stopped the spread of jihadist groups across Middle East, South Asia, and Africa. Nor have they denied these groups territory, which is crucial for the group to train fighters, maintain local insurgencies, and plot attacks against the West. Despite years of airstrikes against al Qaeda and its allies, and more recently the Islamic State, the groups still control territory in Afghanistan, Pakistan, Iraq, Syria, Yemen, and Somalia, and they are waging active insurgencies in Nigeria, Mali, Egypt, the Caucasus, and elsewhere. History sides with no one but Historians do judge. People fond of claiming History's favor forget that and will face some pretty harsh judgement. Read Eliot Cohen's History Doesn't Take Sides. Invoking History is a way of avoiding hard truths. It is a hollow phrase because it is supposed to soothe, not arouse, rally or inform. More importantly, it is simply not true. It presumes that the good guys win. Not always—just ask Rwandans, Cambodians, or surviving family members of Mao’s seventy million victims. Furthermore, the bad guys think the same thing, particularly Marxists, who shortly before their doctrines imploded were supremely confident that they knew in which direction History was marching. In 1956 Nikita Khrushchev famously said to Western ambassadors at a reception in Moscow, “Whether you like it or not, history is on our side.” What he said next, depending on which translation you prefer, was “We will bury you.” Less than 35 years later, the Soviet empire collapsed into ruin. It was a useful warning for lazy politicians: Believe too strongly that your country has a destiny guaranteed by History, and you may ensure that it doesn’t have much of a future. A public that hears the phrase has a right to be skeptical—and nervous. Trump's Muslim Immigration dodge on hard truths. Saudi Arabia and Iran are fighting a war with proxies in Syria and Iraq; Africa and Yemen. That fight's pitched Sunni and Shia against each other in a fearsome slaughter with a lot of collateral butchery including terror attacks like San Bernardino. Obama's convinced each side we favor the other and their war's dragging the world into it. GOP candidates got to get real on strategy on ending this war and confronting the strategic threat of a nuclear Iran. Trump's offering a dumb solution that doesn't protect the US at home, doesn't defeat ISIS, doesn't confront Iran's growing nuclear threat, and doesn't deal with the collapse of the Middle East and Putin's meddling in it. It's a pure political response and the kind of emotional politics we get from Obama. The GOP and America deserve better. We're in deep trouble if this is it. 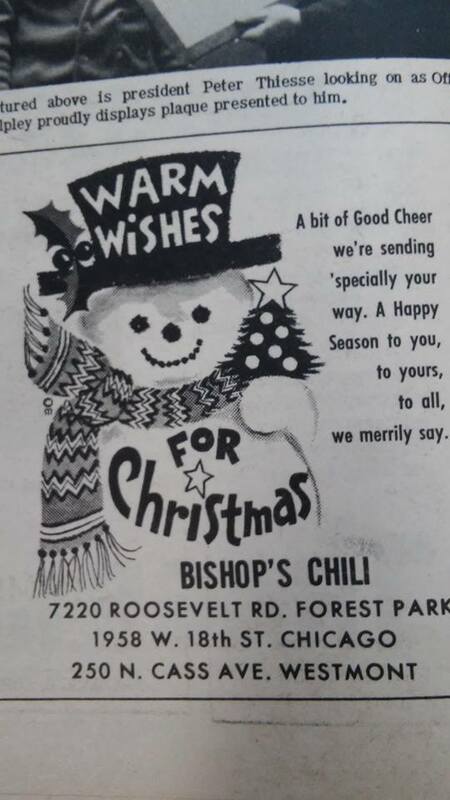 The last lunch Dan Rostenkowski had before going to prison was a bowl of Bishops Chili and one of the first things he had when he got out was another bowl. That story from the guy who served it. An update over at Chicago Patterns on a Washington Blvd classic. UPDATE 11/18/2015After facing an almost certain demolition for the past several months, the Arnold-Crowe House has been sold to owners who are planning to rehab and restore the long vacant house. The previous owner, Peter Creig Toalson, expressed a strong desire to put the home in good hands when his own restoration efforts ran into difficulty. Lisa DiChiera, of Landmarks Illinois, and Matt Cole, of Neighborhood Housing Services of Chicago, are assisting the new owners in identifying tools and resources to mend the historically notable structure. 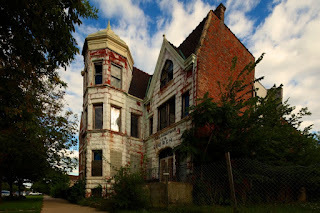 The house is on the 2015 Landmarks Illinois Most Endangered Places List. We’ll continue to update this article with the latest developments. The start of the Revolution. One we failed to support in favor of a let Syria burn policy. We did and not facing the consequences. WaPo Editorial from 2011 on Obama's failures in Syria. Pfarrer Streccius: Syrian statement of civil disobedience: A repost from another blog page I used to keep. From 2011 and a statement from the long gone Syrian Revolution. Folks we should have supported then to avoid the disaster we face now. Finding this on Syrian Facebook pages. Date: April 29, 2011 until 6 May 2011 subject to renewal. Given the suffering of our people, the Syrian peaceful unarmed people at the hands of this regime and his gang criminal of premeditated murder and genocide and the siege of brutal for some regions and in the atmosphere of the media blackout, We, the Syrian people civil disobedience across the country even lifted the siege and Taathakiq all the demands of our people fair. 1 - to maintain a peaceful civil disobedience. 2 - excluding staff and workers and students over time and most important in civil disobedience. 3 - to refrain from the use of transportation and means of transport as much as possible. 4 - to refrain from shopping and only the luxuries of food necessary. 5 - to refrain from the use of cellular and regular phone, except in cases of extreme necessity. 6 - failure of traders and shopkeepers from opening their stores except food stores necessary. 7 - to refrain from paying all taxes and bills and outstanding loans from the state. 8 - to withdraw funds deposited in Syrian banks, both governmental and private. 9 - personal initiative, you are free to choose the form of disobedience, to each according to its location and potential. 10 - put black flags in the lanes and in the storefronts and entrances to buildings. Note: does not include civil disobedience, bakeries, hospitals, pharmacies and Almtajralgmae. The weakest of faith that we are not silent and satisfied with the ongoing assault, murder, torture and genocide to our people Are you satisfied ??? And twitch movement and aspects of life in all sectors to stop the massacres and lifting the siege on our people and achieving the just demands of the Syrian people in freedom and dignity. A documentary with some rough footage on the Islamic State's genocide against the Yezidis. WRB writes a needed column on Syria. Read the whole thing but here are two critical quotes. Let's hope Americans have their common sense and compasses handy. We're in for a tough time. Gov Rauner's decision to refuse refuge to those fleeing the Islamic State. I'm guessing the terrorists already here and don't need a refugee's cover. A twitter from ISIS enough to set them off. Democrats will regret not testing her better with debates if this true. Coalition airstrikes support Peshmerga offensive near Sinjar, Iraq. Her voice was soft and waver­ing as Clin­ton de­livered what polit­ic­al pun­dits call a heart­felt mo­ment. A theat­er crit­ic might call it a quietly power­ful per­form­ance. One after an­oth­er, GOP com­mit­tee mem­bers ques­tioned Clin­ton about why her de­part­ment re­jec­ted Stevens' re­peated re­quests for ad­di­tion­al se­cur­ity. She de­flec­ted the ques­tions by claim­ing the re­quests were handled by State De­part­ment se­cur­ity ex­perts. The pleas nev­er got to her. One after an­oth­er, GOP com­mit­tee mem­bers ques­tioned Clin­ton about her ad­vocacy for the ill-fated in­ter­ven­tion in Libya. She de­flec­ted the ques­tions by say­ing Pres­id­ent Obama made the fi­nal de­cision. Not her. One after an­oth­er, GOP com­mit­tee mem­bers ques­tioned her about the stream of emails she re­ceived from polit­ic­al trouble­maker Sid­ney Blu­menth­al, who passed along in­tel­li­gence on Libya and his neg­at­ive views about the Obama White House. They kept ask­ing: Why could a former re­port­er lobby the sec­ret­ary of State dir­ectly while there was no evid­ence that Stevens had her private email ad­dress? The am­bas­sad­or and his ur­gent se­cur­ity con­cerns went through oth­er chan­nels, Clin­ton replied. Every time I see Clinton I hear Samantha Power's words to The Scotsman from 2008. Earlier, clearly rattled by the Ohio defeat, Ms Power told The Scotsman Mrs Clinton was stopping at nothing to try to seize the lead from her candidate. "We f***** up in Ohio," she admitted. "In Ohio, they are obsessed and Hillary is going to town on it, because she knows Ohio's the only place they can win. "She is a monster, too – that is off the record – she is stooping to anything," Ms Power said, hastily trying to withdraw her remark. This is the Aldertrack free weekday political news aggregation edited by Mike Fourcher & Ramsin Canon. It includes an overview of pertinent Chicago political reporting, data and opinion from across the spectrum. Aldertrack also provides original City Hall political reporting for subscribers. Learn more here. For two weeks of budget hearings aldermen publicly grilled city commissioners and department officials on line items, programs, and overtime, often running from morning to night. Aldertrack monitored aldermanic attendance at each budget hearing, starting with the best attended meeting, the all-day overview with Budget Director Alexandra Holt, Chief Financial Officer Carol Brown, and City Comptroller Dan Widawsky, to the final hearing on Friday October 9. These attendance totals are based on the amount of hearings alderman attended for each individual agency, not total days they were present. And since it is common for aldermen to walk in and out of the chambers during meetings, Aldertrack, which attended every meeting, marked aldermen present if they showed up at some point in the meeting, even if it only for a few minutes. Here's our spreadsheet for a breakdown of attendance by hearing. As Budget Vice Chair, Jason Ervin (28) attended every meeting. He took over whenever Chairman Carrie Austin (34) took a break. While some Council watchers expected Austin to break early because of her lengthy hospitalization last month, she chaired a large chunk of hearings and often stayed until the end of the day. In addition to the first budget hearing, where 90% of the Council was present, the budget hearing for the Police Department and the Department of Streets and Sanitation had at least 40 aldermen present. The 9:00 a.m. morning meetings tended to have the lowest attendance rate and shortest meeting times. We reached out to every alderman who had attendance on the lower end for comment. Most didn't respond. Aldermen who did respond were quick to point out it's common to send a staffer in their place, to have private conversations with commissioners offline, or in the case of committee chairs, to listen to a speaker that live broadcasts what happens in the chamber to their office. "Just because we aren't down there doesn't mean we aren't listening," Ald. Walter Burnett (27) told us. We noted him present at 15 of 32 meetings. Christian Ficara, a staffer for Ald. Brian Hopkins (2), said he often sat in place for Hopkins, whose wife gave birth to a baby boy on Sep. 29. "While Alderman Hopkins was tending to the birth of his first child, myself, and at times a second member of our staff were present during the hearings. We would update the alderman on a daily basis, and he was in contact with commissioners by phone if he had questions regarding their testimony. Obviously, he did attend hearings when time permitted to be away from his wife and newborn son." Ald. Derrick Curtis (18), another new alderman, also missed hearings for family reasons. He was on his honeymoon for most of the budget hearings. Ald. Deb Silverstein (50) wasn't present certain days due to the Jewish holiday of Sukkot (Sep. 27-Oct. 4). "I'm a very observant Jew," she told Aldertrack, "I don't even drive during it." She added that the Mayor knew and she had staff present every day. Ald. Matt O'Shea (19) had one or two staffers at meetings in his place when he couldn't attend. He also attended the International Council of Shopping Centers convention. A double whammy on property taxes [Crain's] - For commercial properties, there's the tax hike and rising assessments. Read the Clout Wiki for backgrounds on Chicago's politicians. Follow us @aldertrack for great tweets. We argue that this force is insufficient to halt the Taliban’s advance. The Taliban seized the provincial capital of Kunduz for two weeks and dozens of districts this year, despite the presence of 9,800 US troops in country. The Taliban also makes the case that a force of 5,500 soldiers is not enough. “If the invaders lost the war in Afghanistan with the presence of hundreds of thousands of troops, their hopes of reversing the tide with five thousand troops are also misguided,” the Taliban said in an official statement that was released on Voice of Jihad. We are loath to admit that the Taliban has a point. A useful set of links if you're into Chicago Politics. Ald. Joe Moreno (1) changed his profile picture to support Planned Parenthood. Ald. Raymond Lopez (15) shared pictures from the Hispanic Heritage Breakfast with Ald. Sue Garza (10), Ald. Danny Solis (25), Ald. Ariel Reboyras (30), Mayor Emanuel, Fire Dept. Commissioner Jose Sanitago, ZBA member Sol Flores, Human Relations Comm. Mona Noriega, and Board of Ed VP Jesse Ruiz. Ald. David Moore (17) shared emergency heating information in conjunction with Cook County Commissioner Robert Steele. Ald. Michael Scott Jr. (24) is holding a job fair today from 11 to 2 at the Douglas Park Fieldhouse. Ald. Danny Solis (25) shared pictures from the re-naming of Ping Tom field house in honor of Leonard M. Louie with Mayor Emanuel. Ald. Roberto Maldonado (26) is holding his first annual Domestic Violence Awareness Walk and Rally from 9AM-10AM today at 25th District Station Auditorium. Ald. Deb Mell (33) is accepting gently-used winter clothing items for donation during business hours until Oct. 24. Ald. Carlos Rosa (35) released a statement on the Barbara Byrd-Bennett guilty plea, and live tweeted from a #FeeltheBern Democratic Debate watch party with Rep. Will Guzzardi. Both are Bernie Sanders delegates. Ald. Anthony Napolitano (41) shared the Edison Park Chamber of Commerce's upcoming events. Ald. John Arena (45) is calling for an elected school board. He also canceled ward night last night. We Wonder Why. Ald. James Cappleman (46) shared pictures from a debate watch party at Drink and Ink. Ald. Ameya Pawar (47) has been joined by Senate President John Cullerton in calling for a return of the #11 bus. Ald. Harry Osterman (48) is hosting three town hall meetings over the course of the week. Civic Federation: $588M property tax hike won't be enough to shore up finances [Sun Times] - Emanuel's budget depends on Springfield and state court ruling too much, Civic Fed says. The Origins of IPRA [South Side Weekly] - How Chicago was pressured to establish an independent police review authority. Why Chicago should care about the Big Beer mega-merger [Crain's] - Job cuts. That's why. Congratulations! You've made it to the bottom of today's newsletter. Thanks for reading. While Bernie might be sick of hearing about Clinton's private server, we hope NO one is tired of hearing about our emails... we hope. Copyright © 2015 Aldertrack, LLC, All rights reserved. You subscribed to this list.